As the Bulls embark on the first of two six-game road trips this season, Bulls coach Tom Thibodeau, in typical fashion, isn’t about to skip any steps. Achieving those results in the short-term will have to happen without the services of starting shooting guard Jimmy Butler. As the team landed in Denver on Wednesday, it was announced Butler has a sprain to his right great toe, an injury commonly referred to as turf toe. Butler will not accompany the team on its current road trip and he is listed as week-to-week. But don’t expect any excuses out of Thibodeau when it comes to getting the job done away from the United Center, where Chicago owns a perfect 5-0 record this season. The Bulls have been ready as of late, winning five straight games for the first time since March of 2012. As they go for No. 6 in a row on Thursday against the Nuggets, Derrick Rose said the team is approaching this road trip with the belief they will continue their winning ways. Though Rose has yet to play his best basketball this season—he’s shot 34.4 percent from the field, well below his career mark of 46.1 percent—both the player and his coach are pleased overall with how he’s played as well as the direction in which he’s heading. A former NBA MVP and three-time NBA All-Star, Rose talked on Tuesday about the personal importance of being a leading scorer. His answer showed not only makes him a great point guard, but a better teammate. 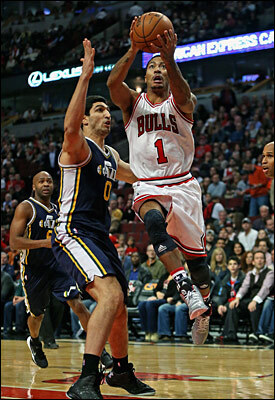 Thibodeau, meanwhile, has no doubt that as Rose takes more shots, he’ll make more. Well-known for the endless hours he spends watching tape, Thibodeau looks at each game to analyze what the Bulls are doing well and what needs to improved upon. In Rose’s case, Thibodeau doesn’t necessarily see it as a situation that needs correcting. As Thibodeau has pointed out before, “It’s a make or miss league.” He likes that Rose has played unselfishly, and as important, that he’s taking good shots and making the right plays. “He’s still figuring out how it’s going, how the game is going, and I think each game he’s gotten more comfortable,” said Thibodeau of Rose. “He’s got to keep attacking, that’s his game. What he’s doing a lot of is forcing the defense to collapse and then making the right play, which I think is giving us rhythm threes. As we continue to shoot better, it will open up the floor more for him. That could be just what the Bulls need to record a sixth consecutive victory when they face the Nuggets, who have averaged 104.4 points per game, seventh best in the NBA. “They’re playing a lot better,” said Thibodeau of Denver, 4-6 on the season. “They’re still a very potent, high scoring team. I think they’re still going through a little bit of an adjustment [under first-year coach Brian Shaw], but they’re playing really well right now. Their point guard play is terrific. When you have guys like Ty Lawson and Andre Miller out there, it always makes your team tough. They have a guy like Nate [Robinson] coming off the bench and you’ve always got to be ready for him.